Summer Savory is a spreading annual herb growing to half a metre tall. Flavour is similar to thyme but more peppery, milder than Winter Savory. Savory can be used to season stews, salads, sauces and pies, pairs well with poultry, beans and cabbage. 8-12 weeks to harvest. Approximately 700 seeds per packet. Summer Savory is native to the Eastern Mediterranean as well as the Caucasus region between Europe and Asia. Pliny the Elder of Ancient Greece gave the name Satureja, which is the name of its genus today, to Summer Savory. Satureja is derived from the word Satyr, a half-man, half-beast creature from Greek and Roman mythology. It was thought that Satyrs inhabited fields of Savory and that this Savory was partly responsible for their passionate nature. Summer Savory has been called the herb of love in the past and has been used as an aphrodisiac. The leaves of Summer Savory are highly aromatic and have a flavour similar to marjoram or thyme but stronger and more peppery. Summer Savory is sweeter, milder and less bitter than it's perennial cousin Winter Savory and is the preferred choice for culinary uses. Summer Savory leaves can be used sparingly to flavour salads or cooked dishes. Savory leaves are strong and full of flavour so don't be afraid to add them early in the cooking process, if added too late they may taste too strong and overpower the dish. Summer Savory is ideal in slow-cooked dishes as its flavour won't be lost during prolonged cooking. Savory pairs well with cooked beans which it where it gets the common name of bean herb from, but it is also well suited for flavouring poultry seasonings, grilled meat marinades, dolmades, stuffed vegetables, stews, meat pies and sauces. Savory is also one of the ingredients used to make the French herb mix known as herbes de Provence which is used extensively in French cooking. Savory leaves are best used fresh but can be dried for longer term storage without loosing too much of their flavour. Sprigs of dried savory can be hung in your clothes cupboards to help repel clothes moth, sprigs that are flowering are said to have the best repellent effect. Summer Savory plants that are left to go to flower provide a nectar source and will attract bees and other beneficial insects to your garden. Choose a full sun location for growing Summer Savory. Ensure your garden soil is loose and free draining before growing Summer Savory plants. Dig over your beds with a fork a few weeks before planting and be sure to incorporate lots of organic matter including well-rotted animal manures, composts and worm castings to improve soil structure and provide nutrition to your growing plants. Don't over-water or over-fertilise Summer Savory or your plants will produce weak, leggy growth. If you start with a rich soil and water plants once every few days after establishment your Summer Savory plants will produce well with little additional care. 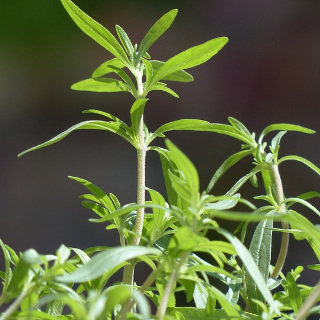 Pick stems and leaves regularly to encourage your Summer Savory plants to produce additional shoots. Once flowers start to form the leaves of Summer Savory no longer taste their best so be sure to plant a few savory seeds every month to ensure a continuous supply of their tasty leaves. In temperate regions of Australia sow Summer Savory seeds during Spring from September to November. In subtropical regions of Australia sow Summer Savory seeds from August to October. In tropical regions of Australia sow Summer Savory during the dry season from April to July. In cooler regions of Australia sow Summer Savory seeds from October to December. Summer Savory seeds are tiny so sow them no more than 3mm deep and firm down the soil around the seeds to prevent too much moisture loss from evaporation. Space or thin Summer Savory plants to about 20cm apart to give the adult plants plenty of room to expand. Summer Savory seeds can be slow to germinate, with seedlings taking between 14 and 21 days to emerge after sowing. Summer Savory takes 8 to 12 weeks to start producing good quantities of leaves. Summer Savory is frost tender so if you live in a frost prone area harvest it and dry the stems before Winter frosts set in.